WASHINGTON, March 19, 2015 /PRNewswire-USNewswire/ — This spring, National Geographic Studios presents an immersive new giant screen film experience that offers a fresh perspective on a modern-day miracle that many of us take for granted: flying. Using spectacular aerial and nature photography, LIVING IN THE AGE OF AIRPLANES carries audiences across 200,000 years of history and around the globe on an epic journey to 95 locations in 18 countries spanning seven continents to remind us how, in a single century, aviation has changed our world forever. The world premiere of LIVING IN THE AGE OF AIRPLANES will take place at theSmithsonian’s National Air and Space Museum in Washington, D.C., on April 8, 2015. 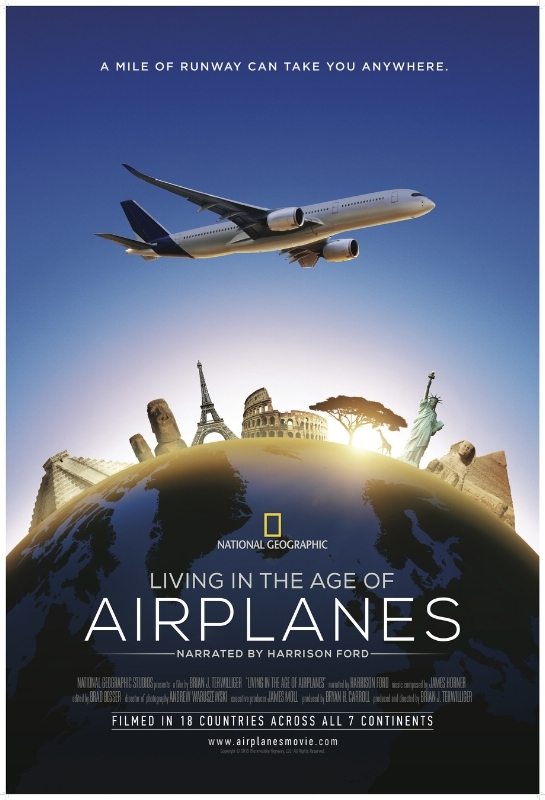 Narrated by actor and pilot Harrison Ford, LIVING IN THE AGE OF AIRPLANES will premiere in IMAX®, giant screen, 15/70mm dome screens and digital cinemas nationwide beginning April 10, 2015. Produced and directed by Brian J. Terwilliger (“One Six Right“), LIVING IN THE AGE OF AIRPLANES features an original score by Academy Award®-winning composer and pilot James Horner (“Avatar,” “Titanic”) and cinematography by Andrew Waruszewski. The film highlights the astonishingly rapid advancements that have led to a world in which 100,000 flights take off and land every day. During the vast majority of mankind’s existence, walking was the fastest means of travel. Yet today, just 175 years after the introduction of the steam engine, boarding a jet to travel thousands of miles in a matter of hours is more often viewed as an inconvenience than a world-changing technological marvel. National Geographic Studios is the video and film production division of the National Geographic Society, one of the world’s largest nonprofit scientific and educational organizations, whose mission is to inspire, illuminate and teach. From television series and specials to giant screen, from mobile video to digital news and educational content, National Geographic Studios’ productions embody the Society’s long-standing reputation for stunning visuals and captivating storytelling. National Geographic Studios has received nearly 150 Emmy Awards and almost 1,000 other industry accolades, including recognition from the Peabody Awards, DuPont Columbia Awards, multiple film and museum industry awards and the highest honors from natural history film festivals. National Geographic Studios also produces and distributes giant screen and digital 3D films for the museum cinema industry. Brooke Runnette is president of National Geographic Studios. Terwilliger Productions is an independent production company based in Los Angeles that produces high-quality, thought-provoking films. The company is best known for the aviation documentary “One Six Right,” a film that celebrates local airports as unsung heroes, which was distributed worldwide. For more information, visit www.terwilligerproductions.com. This entry was posted in Aviation by Phil Dube. Bookmark the permalink. Copyright © 2015 the Romance of Flight All rights reserved.